This picture of a fall recipe above isn’t really a recipe at all. 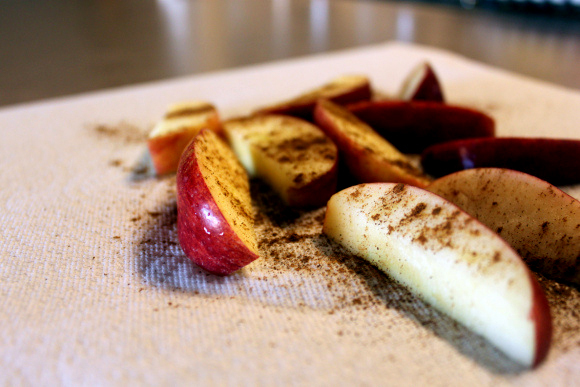 Just sprinkle some cinnamon over sliced apples. These recipes really flip my pancake. I am beyond ready for our third baby to arrive. He’s due in 7 days and being pregnant in the summer is no picnic. Not that I want to go on one right now. Just step outside for a few minutes in Phoenix and you’ll understand why. I am beyond ready to go for a jog again. I love putting on my headphones and heading out early in the morning. This phenomenon alludes my husband who would rather do just about anything besides going for a run. But I love it. Maybe it seems funny to bring up exercise on a food blog… but a hearty walk or a jog makes me more in the mood for hearty, melt-in-your-mouth food. You work hard and you want something that’ll stick to your bones! Yes, I’m definitely ready to run again. I am beyond ready for Fall to arrive. You know, that season that’s supposed to come after summer? It’s not here yet. At least not in Phoenix. Ahem. Let me be clear… PLEASE make these at your earliest convenience. I promise, you will not be sorry. Apple, Ham, & Gruyere Panini. Simple. Melts in your mouth. It may just be my favorite sandwich of all time. I’m serious. Slow-Cooker Honey Barbecue Pulled Pork. This one will make you clap. Your family will celebrate. Hearty & ‘hands-off’ cooking at its best. Honey-Glazed Carrots. Four ingredients. Family favorite. We ALL gobble these veggies up! How could you not? Honey Cornbread Mini Muffins. Ohhhhhh…. I just want to POP one in my mouth RIGHT NOW!! You almost don’t even want butter or honey for spreading on these. Pork Chops & Applesauce. A classic. Homemade. Goodness. Can’t resist making this one several times every Fall! Apple, Brie, & Ham Sandwich. Eat it cold. Eat it hot. Another sandwich favorite of mine. YUM. Sausage & Apple Stuffing. Get yourself in the mood for Thanksgiving. I suggest SPICY sausage for this one! Something about the spicy with the sweet apples and dried cranberries… YUM. Is it November yet? I’M READY!! Slice up a Granny-Smith (or whatever apple you like). Spread on some creamy peanut butter. 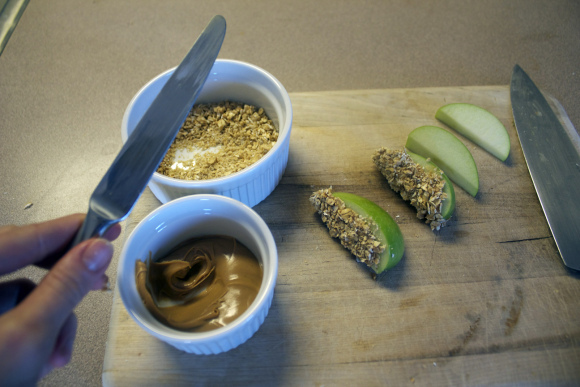 Dip in granola. Apple Tatin. My favorite of the apple desserts. Buttery, moist cake with a caramelized apple topping… um, YES PLEASE. YES PLEASE. YES PLEASE!!!! Sorry, I shout when I get really excited about food. But first, before thinking, I would have promptly ordered and consumed one of them. Peanut Butter Fudge. I’m not sure why I feel that Fall and Fudge go together. Actually this would be a great gift to give at Christmas time… but it’s SOOOOOO good. You’ll be lucky if you can wrap it up before eating half of it yourself. It’s the EASIEST fudge you’ll ever make!! You could make it for dessert at a Fall get-together or for Thanksgiving treats. Or just because. You come up with the excuse. Goat Cheese Cheesecake. This may be your new go-to Thanksgiving dessert instead of pumpkin pie…. Well, in addition to pumpkin pie. Okay, so, just add it to the MUST HAVE list. But you don’t have to wait for Thanksgiving to make it. This will knock somebody’s socks off if you make it for them! Coffee Caramel Bars. These just feel like fall, don’t they? Chewy. Chocolatey. Caramely. You’d have to be CRAZY not to try them. Pick the recipes that tickle your tummy. The ones that rock your socks. The ones that fry your bacon. Scroll. Drool. Pick. Read. Shop. Make. EAT! Those are your seven steps for success.